Vancouver, British Columbia, Canada. 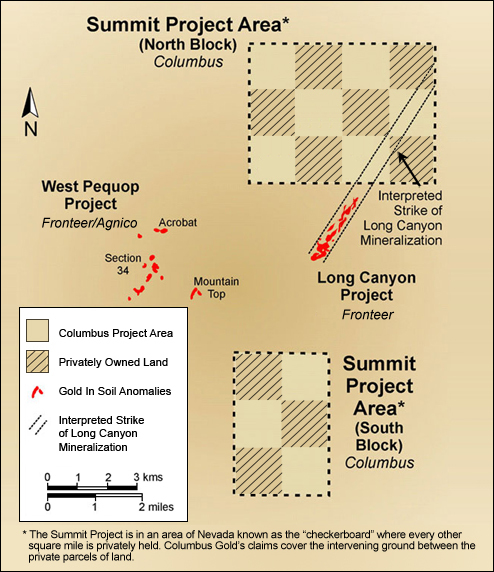 February 4th, 2011, Columbus Gold Corporation (CGT: TSX-V) ("Columbus Gold") announces that its Summit gold project is adjacent to where Newmont Mining Corp. announced yesterday (February 3rd) that it has agreed to acquire Fronteer Gold Inc., and its Long Canyon Project for approximately $2.3 billion. Columbus Gold's Summit Project is strategically located along strike of the Long Canyon gold deposit currently estimated at 1.4 million oz. gold measured & indicated (18.4M tonnes at 2.36 g/t) and 800,000 oz. gold inferred (11.2M tonnes at 2.24 g/t). Step out drilling by Fronteer at Long Canyon continues to move in the direction of Columbus Gold's Summit Project and is now only approximately 1,500 feet (457 meters) away from the Summit property boundary. Columbus Gold's joint-venture partner, Agnico-Eagle Mines, is planning to commence a drilling program at Summit in the first half of 2011 consisting of approximately 6,500 feet (1,980 meters) of drilling. Agnico-Eagle can earn an initial 51% interest in Summit by completing $3 million in exploration expenditures. This release contains forward-looking information and statements, as defined by law including without limitation Canadian securities laws and the "safe harbor" provisions of the US Private Securities Litigation Reform Act of 1995 ("forward-looking statements"), respecting drilling, joint venture earn-in to Columbus Gold's properties, and Columbus Gold's general exploration plans. Forward-looking statements involve risks, uncertainties and other factors that may cause actual results to be materially different from those expressed or implied by the forward-looking statements, including without limitation the ability to acquire necessary permits and other authorizations; a joint venture partner's ongoing willingness and ability to earn into a project; environmental compliance; cost increases; availability of qualified workers and drilling equipment; competition for mining properties; risks associated with exploration projects, mineral reserve and resource estimates (including the risk of assumption and methodology errors); dependence on third parties for services; non-performance by contractual counterparties; title risks; and general business and economic conditions. Forward-looking statements are based on a number of assumptions that may prove to be incorrect, including without limitation assumptions about: general business and economic conditions; the timing and receipt of required approvals; the assumption that a joint venture partner will be willing and able to continue work on the project and to earn into same; availability of financing; power prices; ability to procure equipment and supplies including without limitation drill rigs; and ongoing relations with employees, partners and joint venturers. The foregoing list is not exhaustive and we undertake no obligation to update any of the foregoing except as required by law.